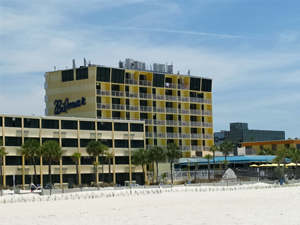 The Bilmar Beach Resort on Treasure Island has been a definitive Florida beach vacation destination for years. The Bilmar is located right on the widest part of Treasure Island's white sandy beach. It is perfect for an early morning run on the one-mile Fitness Trail...or a romantic evening walk along the shore of the Gulf of Mexico. Treasure Island is about as close to Paradise as you can get. Staying at the Bilmar will only enhance that feeling. This Florida gulf beaches resort is within easy walking distance of the Publix Supermarket, beach shops, the used book store/Treasure Island Post Office, and the children's beach playground at the public access to the north. What I like best, though, about the Bilmar Beach Resort is its direct attachment to Sloppy Joe's Beach Bar. What a great place to relax at the end of the day and watch a beautiful Florida beach sunset. You can't go wrong with the food, the ice cold beer, or the quality service. The light blue cover on the outside deck is like a beacon to locals and vistors alike. The second reason I like this place is the weekly Treasure Island Beach Sunday Drum Circle that starts a few hours before sunset and ends at 9:00 PM (DST). It is family friendly. Everybody brings a chair...and a drum...and jams for hours. If your Florida beach vacation includes a Sunday stay, make sure you experience this. There is no way you could do this with guitars, but with drums...it works. There is a distinctive tropical/jungle rythmn that has hundreds swaying and dancing. You really have to see this to believe it can work. 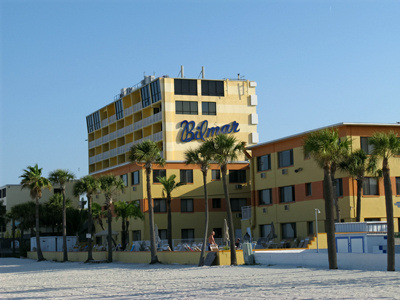 Bilmar Beach Resort for your next stay in Treasure Island Florida. Do I need to worry about Stingray Season?